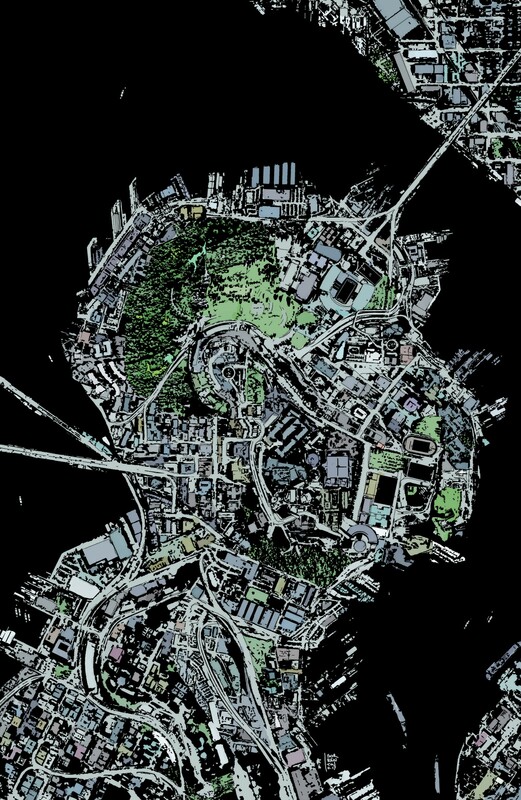 Gideon Falls #1 Review – AiPT! The great creative team behind Green Arrow and Old Man Logan reunite for an interesting story. Gideon Falls is the brand new project from one of the best creative teams in comics. Writer Jeff Lemire and artist Andrea Sorrentino have teamed up together for the first time since their last collaboration on Old Man Logan in February 2017. With one of the best writers and artists in the business they’re setting out to tell a brand new story about a group of unusual characters with deep ties down into the weird world that they are creating together. As usual, Jeff Lemire’s writing is in the top tier of the medium, which is enhanced even more by the storytelling shown through Sorrentino’s absolutely god tier artwork. Comics has one of its best creative teams back together in a book deserving of their brilliance. Sorrentinos fantastic art shines in this 360 view of a characters apartment. Unfortunately, the first issue of Gideon Falls falls victim to the same thing many introductory issues do — it focuses far too much on setup and introducing the characters than having things happen, and as a consequence it can feel slow. Due to this I’m going to speak more about the artwork by Andrea Sorrentino as it is both easier to speak about while also allowing you to experience the writing by Jeff Lemire for yourself. Gideon Falls uses the setup pace of the first issue to show off Sorrentino’s fantastic artwork and layouts, from the detail on a small piece of wood to a 360 perspective of a room — which has a weird warping effect of the walls, but still looks fantastic! Sorrentino makes great use of white space to draw the attention of the reader to the artwork on the page rather than causing it to look too busy. He uses the panelling to continue one scene and break it into pieces despite not much motion happening, rather than repeating his artwork or placing all of the speech onto one large panel. This allows him to show the passage of time, even if it’s brief, while not seeming static, which is something a lot of artists struggle with. The use of primarily pencils with the only inks being incredibly small lines is an incredible choice by Sorrentino as the art on this book would be ruined by typical inking and is brought to an even better visual through the colors by Dave Stewart. The first issue starts slow, but I have a feeling the payoff will be worth it. Gideon Falls features intriguing writing and fantastic art by an all-star team of Lemire and Sorrentino. A slow starting issue with intriguing writing and fantastic art by the great team of Lemire and Sorrentino. Sorrentino's artwork, as always, is absolutely fantastic and some of the best in the business. Lemire's writing sets up an interesting story. A book you definitely want to read for both the art and writing. Unfortunately it suffers from the first issue problem of set up.